SolarX is compatible with the GoPro HERO5 Black, HERO5 Session, HERO4 and HERO3 cameras. SolarX is designed for use with our Blink or BlinkX time-lapse camera controllers for long term operation of GoPro cameras off the grid for time lapse photography and wildlife photography or security when BlinkX/Blink is combined with our X-Band Motion Sensor. Our Solar Enclosures use a 9 Watt solar panel to recharge the included V44 battery. If your installation is in a particularly cloudy or rainy area we also have an 18W upgrade option for additional peace of mind. Our outdoor enclosure is fitted with a sturdy aluminum mounting bracket that contains multiple ¼"-20 threaded holes on the top, back, and bottom for use with standard tripod screws. It also has 2 slots at the back for using straps to attach the enclosure to a pole. The solar panel is removable and attached to the top of the enclosure using a dual ball socket arm so it can be positioned for optimum sun exposure. The solar panel charges the included Lithium Polymer battery which outputs 5 volts to power the camera or other accessories in a weatherproof enclosure. We also offer a sturdy swivel mount for easy mounting to a pole or flat surface, check out the product page here. The enclosures are designed to be crushproof and dust tight. Inside the weather resistant enclosure contains an aluminum bracket designed to hold the GoPro camera, and CamDo Blink Time Lapse Controller. It is possible to access the SD card, or USB connector without removing the camera. If the camera needs to be replaced, the fit is extraordinarily tight, guaranteeing that the camera will be in the exact same position as before so there is no disruption to your time lapse footage positioning. The interior has space for extra batteries or other accessories such as our Motion Detector. The enclosure is fitted with a standard 67mm filter adapter and a neutral density UV optical glass “digital filter” is included. You can replace the filter with your filter of choice. We also offer complete packs of equipment. Check out our packs page here. There is plenty of extra room for a larger battery or other USB powered accessories, or for charging your cell phone in the field. The enclosure is fitted with a standard 67mm filter adapter. You can replace the lens with your 67mm filter of choice. Our case has several mounting options for different situations. There are two ¼” locking holes, one on each side of the case, through which a padlock, bolts, or threaded rods can be used to secure the contents of the box. There are 2 slots on the back of the aluminum mounting bracket which allow it to be easily attached to a pole or structure using straps such as hose clamps or zip ties. The tripod screw holes at the back of the bracket can then be used to angle the camera. We also offer a high quality swivel mount bracket that can be added to your system which allows fantastic aiming flexibility. Read more here. The aluminum mounting bracket has multiple tripod screw holes on the top, back, and bottom that can be used with any standard photographic tripod or mounting bracket with a normal tripod thread (¼"-20). ¼"-20 bolts are easily obtained from any hardware store if you are making your own mount. There are hundreds of different compatible mounting brackets and magic arm brackets. If your installation is in a particularly cloudy or rainy area we also have an 18W upgrade option. Always On Mode: does not automatically shutdown when inactive. Padlock holes: 2 at top to secure the contents. Mounts: Aluminum bracket with tripod holes (¼"-20) on the top (2x 1.75"spacing), back (3x 2.75"spacing), and bottom (1x centered), as well as two 1.1" slots (2.5"spacing) at back for strapping to a post. Compatible with the GoPro HERO3, HERO3+, HERO4, HERO5 and Session cameras. Which CamDo Solar System is right for my GoPro camera? Our SolarX Enclosures are compatible with GoPro HERO3, HERO3+, HERO4, HERO5 and Session cameras. Refer Compatibility tab. How do I setup my system? View the Solar Power System set-up guide here. In direct sun, the V15 (4,000 mAH Lithium Polymer battery) will fully charge in approximately 5.5 hours using the previous 6W solar panel model. Our newer systems use a 9W solar panel option which can charge the included V44 battery typically in a day. Where it is particularly cloudy/rainy, we recommend our 18W upgrade option. The battery system incorporates protection against overcharging, over discharge, over current (short circuit), unusual voltage input, and temperature extremes. Will the solar panel be able to keep my time lapse running indefinitely? This would depend on the shooting cycle used and the sun exposure available in your location. We advise all customers to calculate their battery needs due to the many variables. We have a Time Lapse Calculator that can be used to help determine your ideal shooting interval and how long your battery should theoretically last using our controller boards and batteries. The Calculator also gives the rate at which the solar panel should be able to recharge your battery at your given location and with the panel angle that is used. Keep in mind that temperature, battery fatigue, and other electrical inefficiencies will prevent the camera from using the full battery capacity. What is the original dust and water ingress rating of your enclosures? Can I submerge your SolarX or DryX enclosures? The enclosures have an IP67 rating prior to installation of CamDo accessories. Our SolarX and DryX enclosures are not meant to be immersed in water. How long will the battery last before it is discharged? It depends on many factors including your latitude, the amount of sun and cloud during your shoot, the controller you are using, the camera you are using and the shooting schedule you have programmed. There are too many variables to give a perfect answer but we have created a Time Lapse Calculator to work out the best setup for your shoot in your location. This uses our analysis of the power consumption of the various GoPro cameras and provides an explanation of how to calculate the theoretical battery life. Practically, we have run the system indefinitely taking one picture every 15 minutes with the WiFi on, in Canada in the summer. Since our controllers turn the camera off between triggers to conserve power, Always On mode is important to prevent the battery from automatically turning off. Most of the USB battery packs on the market have an automatic power saving feature which turns off the battery if the battery is not constantly supplying power to a device. If the GoPro is powered off for more than a few minutes between triggers, the external battery might automatically shutdown due to inactivity. However, our V44 and V15 battery packs have two modes of operation, the standard Auto Off mode and an Always On mode. The Always On mode prevents the battery from automatically turning off when insufficient current is being drawn due to the camera being powered off. Refer to our support page here to make sure you are in "Always On" mode when setting up your system. Refer Step 2 of the guide. Make sure to disconnect the battery from all devices to check this. If you hold down the power button for at least six seconds and the charge indicator flashes 3 times and stays lit for a second or two, you are now in Always On mode. If you hold down the power button for six seconds and the charge indicator flashes 3 times and then goes dark straight away, you are in Auto Off mode. How can I avoid condensation on the lens? Our enclosures have an integrated auto-pressure valve that equalizes the atmospheric pressure difference to reduce condensation. The IP67 micro vent allows air to pass through while preventing water from entering. If you need additional protection against condensation, the extra space in the solar enclosure allows for one or more sacks of desiccant to be inserted in the box. For even more protection, there are some products available to coat the lens, such as those used on ski-goggles. The standard 67mm threaded lens filter can also be replaced with another 67mm threaded lens that already has anti-fog characteristics or coating. TIP: Condensation is a result of humid air being sealed in the box when you close it and condensing when there is a temperature change. Try to close the box in as dry an environment as possible. If you need additional protection against condensation, the extra space in the solar enclosure allows for one or more sacks of desiccant to be inserted in the box. For more information, Google for avoiding condensation in underwater cameras, where the problem is discussed at length by many experienced photographers. Can I lock the case? There are two ¼” locking holes, one on each side of the case, through which padlocks, bolts, or threaded rods can be used to secure the contents of the box. Is it possible to separate the solar panel from the box? Yes. The solar panel is removable and has a 4ft charging cable that enters the enclosure through a waterproof cable gland at the bottom of the enclosure. Can I mount the solar panel remotely from the enclosure? Yes. However, if you need to place the panel remotely from the enclosure, attention must be paid to the gauge of wire used to connect the solar panel to the battery. The connectors on the solar panel cable are 3.5mm outer diameter, 1.1mm inner diameter barrel power connectors. So you'll need one end male (M3.5x1.1), the other one end female (F3.5x1.1). A local electronics store will have these connectors. We recommend using the largest cable that can physically fit into the particular connector you source to minimize voltage drop from the panel to the battery. The voltage drop must not exceed 0.5 volts. A 16 AWG or larger wire is recommended for distances exceeding a few feet. Alternative 1" ball mount accessories such as our Tough Claw can be used to mount the solar panel away from the enclosure using the sturdy dual ball socket system. Which cables and adapters come with the system and what do I use to connect the battery to the solar panel? The system comes with all necessary cables along with a number of useful adapters for charging phones and other cameras as well as the cables used to charge the battery. Refer to Our Solar Setup Guide. Can I use this system to charge other devices as well? Absolutely. The V44 battery pack can be used to charge any 5V device. Can your systems be used for other purposes than GoPro cameras? Yes. You can remove the GoPro mounting fixture to provide extra space for your equipment. The solar panel, battery, and enclosure can be used for your custom system or just used as a remote charging station for phones and other USB chargeable devices. Does the enclosure O-Ring seal require special care? The case is equipped with a hollow core EPDM gasket that has been designed to give superior performance and resist compressive deformation over time. To ensure a watertight seal, the gasket must be free of cuts, abrasions or tears. Debris or foreign material caught between the sealing rib on the bottom of the case and the gasket on the top of the case will prevent the case from sealing properly. A coat of an automotive type surface protector is recommended to help prevent dirt and debris from sticking to the seal. If the seal becomes damaged a replacement seal can be ordered from Cam-Do.com. Special care should be taken to ensure that wires or cables do not get trapped in the door when it is closed. The power-claw latches can exert extreme force, resulting in damage to the cable and the O-ring seal. Also, read the FAQ's tab for more information. The SolarX-18W upgrade, adds an extra 9W solar panel to give you a total of 18W of power (2 x 9W panels). It comes with all necessary attachments (ball arm, socket) and wiring to get up and running in no time with your existing SolarX. The SolarX outdoor enclosure is fitted with a sturdy aluminum mounting bracket that contains multiple ¼"-20 threaded holes on the top, back, and bottom for use with standard tripod screws. The SolarX-18W upgrade is simply attached to the bracket using the included ball mount and associated arm. 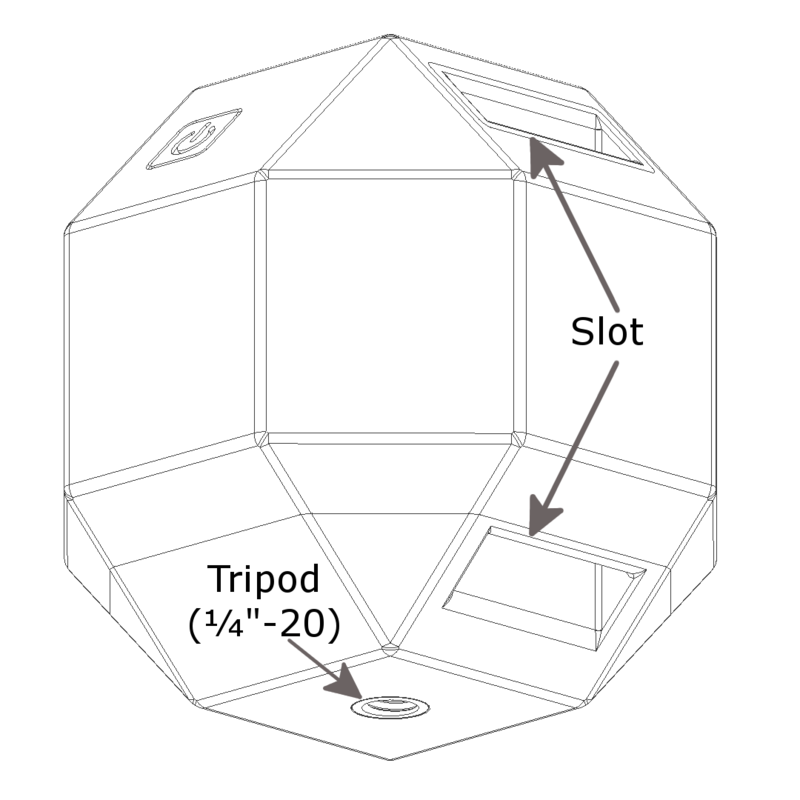 The solar panel is removable and attached to the top of the enclosure using the included dual ball socket arm so it can be positioned for optimum sun exposure. The 2 x 9W solar panels charge the V44 battery (included in your SolarX) simultaneously so if one panel gets dirty or covered by shadow, the second panel will continue to work hard for your project. Our solar systems are designed for long term operation of your GoPro camera off the grid for time lapse photography and wildlife photography or security. The Solar Kit consists of a 9W panel that upgrades your CamDo SolarX system to 18W of solar power (2 x 9W panels from the standard 1 x 9W panel). If you are looking for the Solar Kit for our ShootX camera, click here. The Solar Kit adds an extra 9W solar panel to give you a total of 18W of power (2 x 9W panels) when using SolarX. It comes with all necessary attachments (ball arm, socket) and wiring to get up and running in no time with your existing SolarX. The SolarX outdoor enclosure is fitted with a sturdy aluminum mounting bracket that contains multiple ¼"-20 threaded holes on the top, back, and bottom for use with standard tripod screws. Each solar panel is simply attached to this bracket using the included ¼"-20 ball mount and associated socket arm so the panel can be positioned for optimum sun exposure. The 9W Solar Panel Kit includes a "(2Fx1M) Y-cable" that can be used to connect two solar panels to simultaneously charge a single V44 battery (included with SolarX). 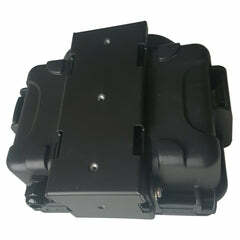 Alternatively, our outdoor housings can fit two V44 battery packs that can each be charged from a separate solar panel. So if one panel gets dirty or covered by shadow, the second panel will continue to work hard for your project. Note, the outdoor enclosure is NOT included. Please see our SolarX product page. For battery and enclosure specifications, please see our SolarX product page. The 9Watt Solar Panel Kit is only compatible with our DryX and SolarX Enclosures that have a aluminum mounting bracket and cable gland entry (product codes HSO04 or HDR03). It is not compatible with previous versions. The Solar Panel cannot be connected directly the camera or BlinkX. The solar panel does NOT output a regulated 5Volts and is used to charge our V44 or V15 battery packs. Which CamDo Solar System is compatible with the SolarX-18W upgrade? The SolarX-18W upgrade is only compatible with the SolarX system. It is not compatible with previous versions. Refer Compatibility tab. The marine grade aluminum swivel mount kit consists of a 6" long straight swing arm on a vertical mounting base for attachment to a flat or rounded surface such as a wall or post. The opposing end is a ball socket used with the 1.5" ball mount plate that can be attached to our SolarX or DryX outdoor enclosure for ultimate aiming flexibility. The swing arm pivot allows for full 360-degree rotation and the ball and socket system allows a 360-degree rotation with a 180-degree pivot. There is an insert on the vertical mounting plate to allow solid mounting to a flat surface like a building or a rounded surface such as a pole or rail. The mount is the perfect complement to our SolarX and DryX outdoor enclosures and is included as an option with our Construction Time Lapse kits. The CamDo DryX Enclosure is designed for housing the GoPro camera (HERO3, HERO4, HERO5 Black, HERO5 Session, & HERO6) with our Blink or BlinkX time-lapse camera controllers and V15/V44 battery packs. Our tough, weatherproof† dry enclosures are designed to be crush proof, air tight, UV resistant and built to survive in a hostile environment. The DryX enclosure is the same enclosure that ships with our SolarX Enclosure Power System but does not include a battery pack or solar panel. 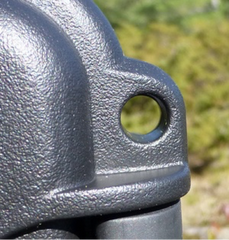 Our outdoor enclosures are fitted with a sturdy aluminum mounting bracket that contains multiple 1/4"-20 threaded holes on the top, back, and bottom for use with standard tripod screws. It also has 2 slots at the back for using straps to attach the enclosure to a pole. Inside the enclosure contains an aluminum bracket designed to tightly fit the GoPro HERO3, HERO4, HERO5 Black, and HERO5 Session cameras with a CamDo time lapse camera controller such as BlinkX. The interior has space for extra batteries or other accessories. One accessory that can be used with BlinkX or Blink is our X-Band Motion Sensor that can detect motion through the walls of the enclosure without requiring extra opening for the signal to pass through. The enclosure is fitted with a standard 67mm filter adapter and a neutral density UV optical glass “digital filter” is included. You can replace the filter with your filter of choice. † These enclosures are not submersible. The degree of water resistance depends on the mounting method and options selected. They are suitable for general outdoor use. The aluminum mounting bracket has multiple tripod screw holes on the top, back and bottom that can be used with any standard photographic tripod or mounting bracket with a normal tripod thread (1/4" x 20). 1/4 x 20 bolts are easily obtained from any hardware store if you are making your own mount. There are hundreds of different compatible mounting brackets and magic arm brackets. Compatible with the GoPro HERO3, HERO3+, HERO4, HERO5 Black, and HERO5 Session cameras and CamDo Solutions products. Can the DryX enclosure be powered by mains power? The DryX enclosure has a removable plug at the bottom that provides a 3/4" (19mm) hole to allow AC power or other cabling to enter the enclosure. A 5V 2A USB wall adapter can be used to power the camera system inside the enclosure. If you would like more power reliability in case of power outages, the DryX enclosure has space to house our V15 or V44 batteries that can be used as an Uninterruptible Power Supply because they can supply power while charging and be used in an "Always On" mode. How many battery packs can fit inside the DryX Enclosure? The DryX enclosure can fit up to three V15 or two V44 battery packs that both have the Always On mode that is required for long term deployment using our controller boards. Since our controllers turn the camera off between triggers to conserve power, Always On mode is important to prevent the battery from automatically turning off. Most of the USB battery packs on the market have an automatic power saving feature which turns off the battery if the battery is not constantly supplying power to a device. If the GoPro is powered off for more than a few minutes between triggers, the external battery might automatically shutdown due to inactivity. However, our V15 and V44 have two modes of operation, the standard Auto Off mode and an Always On mode. The Always On mode prevents the battery from automatically turning off when insufficient current is being drawn due to the camera being powered off between triggers. It depends on many factors including the outside temperature, the age of your battery, controller you are using, the camera you are using and the shooting schedule you have programmed. There are too many variables to give a perfect answer, but if you are taking time lapse images, we have created a Time Lapse Calculator that can be used to help determine how long your battery should theoretically last using our controller boards. The calculator can also be used to determine your ideal shooting interval based on the length of the project and final video clip length you are trying to achieve. The enclosures have an IP67 rating prior to installation of CamDo accessories. Our SolarX and DryX enclosures are not designed to be immersed in water. Features 4K30, 1440p60 and 1080p90 video, 10MP photos up to 30 frames per second, built-in Wi-Fi and Bluetooth®, and Protune™ for photos and video. Waterproof to 33’ (10m). With resolutions of 4K30, 1440p60, 1080p90 and 720p120 for crisp, smooth footage. Integrated (non-removable) battery is rechargeable to enable extended recording. The GoPro HERO5 Session camera is compatible with these CamDo Solutions Products. Features 4K30, 2.7K60 and 1080p120 video, 12MP photos up to 30 frames per second, built-in Wi-Fi and Bluetooth®, and Protune™ for photos and video. Waterproof to 131’ (40m). Allows you to capture time lapse footage. 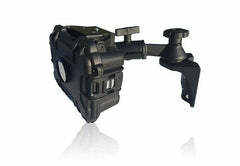 Enables use at depths of up to 131', so you can capture your underwater adventures in stunning high-definition. The GoPro HERO4 Black camera is compatible with these CamDo Solutions Products. This 15 Watt-Hour Lithium Polymer battery outputs 5 volts at up to 1A to power a GoPro camera or other accessories. The USB Battery Pack has a selectable Always On operating mode that is required for long-term deployment using our Blink controller. Under normal circumstances, the standard GoPro battery will last for one to two hours of shooting. The CamDo Blink controller can be programmed to turn the camera off between shots to only have the camera powered on when the footage is needed. However, while Blink can extend the length of time the camera can be deployed on a single battery, the total amount of time the camera can remain powered on is still the same. The V15 battery increases the GoPro battery life by approximately 4x and has the Always On operating mode required for use with our Blink controller. There are a lot of battery packs available, however, don't be fooled by cheaper alternatives. Most of the USB battery packs on the market have an automatic power saving feature which turns off the battery if it is not continuously supplying power. Often, this feature is not even mentioned in the battery description, and only discovered when you find the camera's internal battery is dead, even though the high powered battery pack is still fully charged. Up to four V15 battery packs fit in our Weather Resistant Outdoor Enclosures and one V15 battery is included with our 6Watt Solar Power System. Up to three V15 battery packs can fit inside of our DeepEXT aluminum deepwater housing extension. The V15 comes with all necessary cabling to parallel up with other V15 batteries including the V15 that ships with our Solar system. See the FAQ's and Support tab on this page. Always On mode that is required when using our Blink controller since it prevents the battery from automatically turning off due to inactivity. Automatic Off mode will automatically turn the battery off after 20minutes of inactivity. The battery is protected against failure due to overcharging, over discharge, overcurrent (short circuit), unusual voltage input, and temperature extremes. Compatible with 5V USB Devices. It depends on many factors: the controller you are using, the camera you are using and the shooting schedule you have programmed. There are just too many variables to give an accurate answer. In theory, the 4,000 mAh V15 battery combined with the standard GoPro 1,050 mAh battery will give you about 5 times the shooting time. Combine multiple V15 batteries together in parallel (you can fit 4 x V15's in our solar enclosure to provide 16,000 mAh (60 Wh)) to give you that extra shooting time. An analysis of the power consumption of the various GoPro cameras and an explanation of how to calculate the theoretical battery life is outlined on the GoPro Power Consumption page. Our Time Lapse Calculator page can be used to assist you in planning the interval times of your time lapse project. How do I connect multiple V15 batteries together? Additional V15 batteries can be ordered for use with our Solar and weatherproof enclosures (4 x V15's can fit in our enclosure) for extra shooting time. All of the wiring to connect them together comes with the batteries. It just a simple matter of plugging them together as per our guide here. How many V15 batteries can fit in the solar or DRY weatherproof enclosures? Up to 4 x V15's can fit in either the Solar or weatherproof DRY enclosure. It just a simple matter of plugging them together as per our guide here. How can I tell when the battery is in Always On mode? It is easiest to determine the operating mode when the battery is disconnected and neither charging or supplying power to a device. When in Always On mode, if you double tap the power button a few times, the LED should continue to stay lit. If the LED goes dark between every other double press, you are not in Always On mode. How can I change the operating mode? To switch modes, hold down the power button for six seconds. If the charge indicator flashes 3 times and stays lit for a second or two, you are now in Always On mode. If the charge indicator flashes 3 times and then goes dark, you are now in Auto Off mode. If you are not in the desired mode. Press the button again for 6 seconds to change modes. The 44Watt-Hour Lithium Polymer battery features two 5V USB output ports: a high power 2A port (recommended for the GoPro camera) and a 1A port for other accessories. The USB Battery Pack has a selectable "Always On" operating mode that is required for long-term deployment using our Blink and BlinkX controllers. Under normal circumstances, the standard GoPro HERO4 battery will last for one to two hours of shooting. The Blink or BlinkX can be programmed to turn the camera off between shots to only have the camera powered on when the footage is needed. However, while Blink can extend the length of time the HERO3+ and HERO4 cameras can be deployed on a single GoPro battery, the total amount of time the camera can remain powered on is still the same. The V44 battery increases the GoPro battery life by approximately 11x and has the Always On operating mode required for use with our Blink and BlinkX controllers. BlinkX requires an external power source and cannot be powered directly from the GoPro battery. Up to two V44 battery packs fit in our Weather Resistant DryX/SolarX Outdoor Enclosures and one V44 battery is included with our SolarX Enclosure. Always On mode that is required when using our Blink or BlinkX since it prevents the battery from automatically turning off due to periods of inactivity. 5V, 2A USB port that is recommended for powering the GoPro camera. 5V, 1A USB port that can be used to power other accessories. The 12,000 mAH V44 battery combined with the standard GoPro 1,050 mAH battery should give you more than 12 times the shooting time. To switch modes, hold down the power button for at least six seconds. If the charge indicator flashes 3 times and stays lit for a second or two before going dark, you are now in Always On mode. If you are not in the desired mode. Press the button again for at least 6 seconds to change modes. The SanDisk Extreme 64GB microSDXC Memory Card from is A2 and U3 rated to provide a minimum write transfer rate above 30MB/s (U3 rated SD cards are required for use with GoPro cameras). This SD card is supplied with a "full sized SD" card adapter for high-speed file transfer to your computer via an SD card port. Our ShootX Mounting Kit provides secure and repeatable mounting for your ShootX camera. The mounting kit for ShootX consists of three parts: a slotted wall plate, a 4" aluminium camera arm, and security lanyard. The camera arm slots into the wall plate and locks with a single release pin. The wire lanyard is then looped through the slot of ShootX and anchored to the mounting arm's release pin for theft protection. The camera arm has a 360 degree rotating tripod (¼"-20) ball joint with 25° tilt for easily positioning the direction of the camera. Once the camera has been positioned, the tripod's adjustment knob can be tightened to prevent further movement of the tripod ball. Loosening the camera arm's release pin allows for the camera and arm to be removed from the slotted wall plate to access the camera without affecting the direction of the camera's position when re-instated providing a repeatable mounting system. 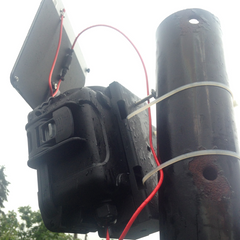 Also check out the ShootX Solar Kit for long term off-grid deployment of your ShootX time lapse camera. The ShootX Mounting Kit is designed for use with our ShootX camera (product code CMR001). Can I use the ShootX Mounting Kit with other CamDo products? No, the ShootX Solar Kit is only compatible with the ShootX camera. Our ShootX Solar Kit allows operation of your ShootX camera off-grid for long term time lapse and remote monitoring deployments. The ShootX Solar Kit consists of a 9 Watt panel with 5 Volt power regulator, a long tip microUSB for connection to the ShootX camera and mounting accessories. If you are looking for the Solar Kit for our GoPro Outdoor Enclosures - DryX and SolarX, click here. The ShootX Solar Kit provides a 5Volt regulated output from a 9Watt solar panel to recharge the ShootX camera battery. It comes with two mounting attachment options and wiring (long tip microUSB) for connection to the ShootX camera. The two mounting options are either an aluminum baseplate that can be fastened to a flat surface, or a ¼"-20 threaded ball screw. The regulated long tip microUSB power cable has a 2m length (78") that allows for the solar panel to be positioned away from the ShootX camera, while the ball-socket arm connects to either ball base to provide a wide range of angle adjustment so the panel can be positioned for optimum sun exposure. 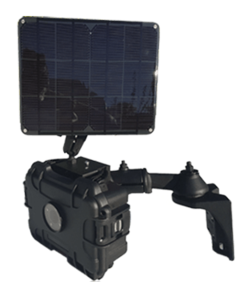 The 9W Solar Panel Kit also includes a "(2Fx1M) Y-cable" that can be used to connect multiple solar panels to simultaneously charge a single ShootX camera. Also check out the ShootX Mounting Kit for easy and repeatable mounting of your ShootX time lapse camera. The ShootX Solar Kit includes a 5V regulated micro USB cable with an extra long tip for compatibility with our ShootX camera (product code CMR001). Can I use the ShootX Solar Kit with other CamDo products? It depends on many factors including your latitude, the amount of sun and cloud during your shoot and the shooting schedule you have programmed. There are too many variables to give a perfect answer but we have created a Time Lapse Calculator to work out the best setup for your shoot in your location.